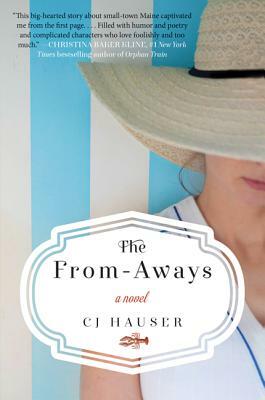 Fresh talent CJ Hauser makes her literary debut with The From-Aways, an irreverent story of family, love, friendship, and lobsters, in the tradition of J. Courtney Sullivan’s Maine and Richard Russo’s Empire Falls. Two women come to Maine in search of family, and find more love, heartbreak, and friendship, than they’d ever imagined one little fishing town could hold. When Leah, a young New York reporter, meets Henry, she falls in love with everything about him: his freckles, green thumb, and tales of a Maine childhood. They marry quickly and Leah convinces Henry to move back to Menamon. As Leah builds a life there, reporting for The Menamon Star and vowing to be less of an emotional screw-up, the newlyweds are shocked to discover that they don’t know each other nearly so well as they thought they did. When Quinn’s mother dies, she tracks down the famous folk-singer father she’s never known, in Menamon. Scrappy and smart-mouthed, Quinn gets a job at the local paper, an apartment above the town diner, and tries to shore up the courage to meet her father. But falling in love with her roommate, Rosie, was never part of the plan. These two unruly women’s work relationship at The Star deepens into best-friendship when they stumble onto a story that shakes sleepy Menamon—and holds damaging repercussions for Leah’s husband and Quinn’s roommate both. As the town descends into turmoil, both women must decide what kind of lives they are willing to fight for. CJ Hauser's fiction has appeared in Tin House, The Kenyon Review, TriQuarterly, and Esquire. She is a recipient of McSweeney's Amanda Davis Highwire Fiction Award and winner of the Jaimy Gordon Prize in fiction. She is pursuing her Ph.D. in English at The Florida State University.